Recent polls reflect increasing belief that climate change is a problem, yet it still seems few are doing anything about it. This observation results from a phenomenon we have termed the “Climate Tipping Point,” that is the point where climate awareness leads to human initiated action. Increasing climate change awareness is an important first step; but without additional motivation to tip a person to action, we cannot make the progress needed to address this issue. There is a gap in the percentage of people who view climate change as a problem and those that believe human action is necessary to combat it, which we described as the climate action gap. Understanding how to bridge the climate action gap is necessary to positively change human behaviors related to climate mitigation and adaptation. What drives the disconnect between climate awareness and the belief that human action is necessary to combat the climate crisis, both at the individual and at the countrywide level? This is a question gaining traction in the world of climate research and is the focus of our research project. Many studies explore the psychological factors that contribute to this disconnect at the individual level. Whether it’s faith that technology can solve the issue, failure to comprehend the impact of an individual action, or trouble comprehending the effects of incremental changes, many individuals believe that human-initiated action to reduce the effects of climate change is unnecessary. Climate change education and policy implementation are good ways to influence people who view climate change as a major issue and just need to take that next step toward action. Many things could prompt this step, but costs and relevance of the climate action are good motivators. It is our hypothesis that risk perception, when people feel that their life is personally at risk, is a strong driver impacting an individual’s likelihood to take action to combat climate change. Explore this background further with our first infographic! There is limited research on factors contributing to the climate action gap at a countrywidelevel, so we explored several factors that could be instrumental for policy implementation. In 2015, Pew Research Center conducted the Global Attitudes Study sampling individuals from 40 countries, which included questions on climate change. A difference in population percentage of people who said climate change is a very/somewhat serious problem and those who said human action is necessary to reduce the effects of climate change was noted worldwide, which we calculated as the climate action gap and represented geographically. 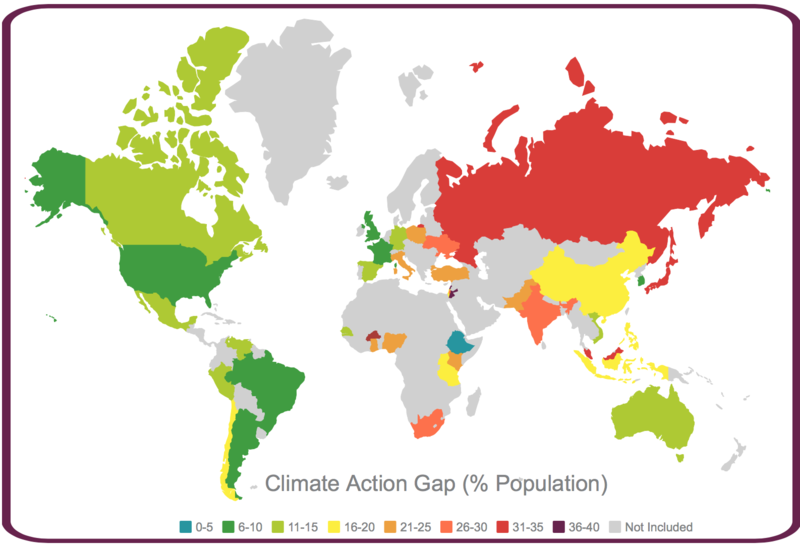 Our research compared the climate action gap for each country against factors including economics, equality, education, and risk perception to explore their potential contribution as drivers for this behavior. Economics, measured by GDP, averaged a 6% higher climate action gap for the poorest 15 countries as compared to the richest 15 countries . Equality yielded a 3% higher climate gap for countries with a higher (more unequal) Gini Index. Education did not influence the climate action gap, suggesting that climate change education may not be the determining factor in motivating individuals toward climate action. Another PEW survey question explored if people felt they would be personally affected by climate change, which we attributed as perceived risk. This value demonstrated a positive correlation when plotted against climate action showing that countries whose residents feel more at risk from climate change are more likely to believe human action is necessary to address it, and a trend was observed for those countries as presenting with lower climate action gaps. Curious about our results? Check out our second infographic! Understanding the interplay of these factors is important to inform climate policy and for its success, and should focus on the need for human-initiated action and building public support for climate-friendly solutions. Wondering about specific policy examples? Check out our last infographic! Are you victim to the climate action gap? If so, what will push you over the tipping point? Check out our podcast on this issue!